For the third edition of International Journal of Open Youth Work the partnership calls for Abstract on the topic of identity and diversity in practical youth work. The Journal is published online once a year and contains peer-reviewed articles, explorations of good practice, methodology, research, policy analysis, book reviews and conference papers. It is aimed at open youth workers; youth work academic specialists, researchers, policy makers and stakeholders. Contributions to the journal are sought from, academic researchers/scholars, youth workers and stakeholders who are active and/or have a professional or political interest in youth work. The Journal encourages co-writing where academics and youth workers write together. Deadlines: The 3rd issue will be published online in March 2019. Deadline for submission of abstracts 8th of October 2018. All submissions should have a short abstract of 250 words, 5 key words, and a short biography of the authors of 100 words maximum. The length of all submissions shall be between 2,000-5,000 words maximum including bibliography. • Research: where researchers and practitioners/stakeholders write together; for instance on projects of action research or theoretically grounded projects aiming to develop youth work or to develop the organisation or management of youth work. 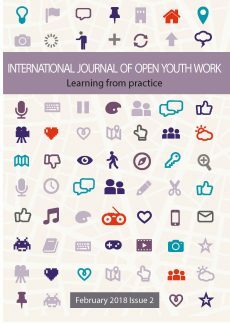 • Articles: which should contain an extended discussion on theoretical and/or methodological (research) issues concerning open youth work connected to the research project being discussed. • Critical Conversations or Provocation: present an article containing experiences of youth work and/or thoughts on youth work in order to highlight and discuss conditions, possibilities and problems in or connected to open youth work in a broader sense. The aim is to create debate or open up for new perspectives. • Good Practice Sharing: present an outline of a new or dynamic piece of youth work practice. • Book Reviews: provide a review of new books and or journal articles that especially focus upon youth work methodology and its broadest subject of interest. • Conference papers: papers should focus upon youth work methodology, research, ideas, innovations, or provocations. All submissions will be read by a member of the Editorial Board, before being submitted to a system of blind peer reviewing by two external assessors one of which will be a youth work practitioner the other an academic. It will then be discussed at the Editorial Board. A decision will be made on your submission. In citing references please use the Harvard referencing for books and articles. Bibliographical references in the text should quote the author’s name and date of publication as follows (Johnstone, 1999). Notes and references should normally be given, in alphabetical order by author, at the end of the article. Articles not submitted in the appropriate format will be returned to the author before being considered for publication. Copyright, individual authors are responsible for ideas and opinions expressed in their articles and for obtaining the necessary copyright. Articles are accepted on the understanding that they are not published elsewhere and authors are required to transfer copyright to the publisher of the Journal. Submission of articles and reviews, manuscripts for publication may be made to any member of the Editorial Board, or directly to the Editors.